Off the coast of Antarctica, beyond the McMurdo Station research center at the southwestern tip of Ross Island, lies Hut Point, where in 1902 Robert Falcon Scott and his crew established a base camp for their Discovery Expedition. Scott’s ship, the Discovery, would soon thereafter become encased in ice at Hut Point, and would remain there until the ice broke up two years later. Given recent events, it appears that Scott (and his ship) could have had it much worse. Sea levels in McMurdo Sound off the southwestern coast of Ross Island have recently reached their lowest levels since 1998, and last month, the area around the tip of Hut Point became free of ice for the first time in more than 10 years. The pictures below, taken by the Moderate Resolution Imaging Spectroradiometer on NASA’s Terra satellite and made public by NASA’s Earth Observatory, show the progression of the ice melt in the Sound dating back to 2003. 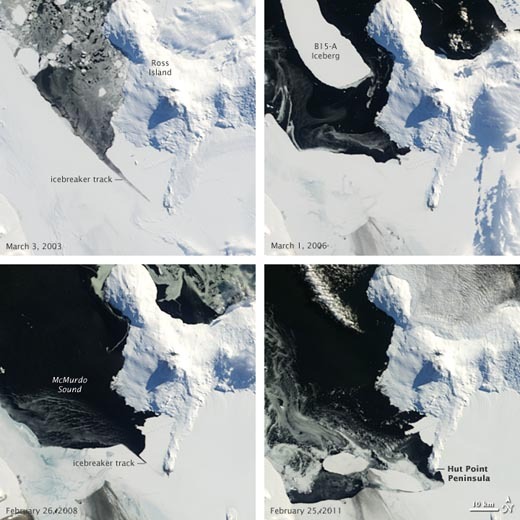 The upper-right image shows a chunk of the B-15 iceberg, which when whole exerted a significant influence on local ocean and wind currents and on sea ice in the Sound. After the iceberg broke into pieces, warmer currents gradually dissipated the ice in the Sound; the image at the lower right, taken on February 25, shows open water around Hut Point.